Braising fish is another very light and healthy way of cooking fish. This method allows the fish to hold its natural flavors without losing most of its nutrients. And does not necessarily require any additional fat. It is suitable for most kinds of fish in any form - from steaks, fillets, or whole fish. Braising is also sometimes known as pot-roasting, oven-steaming, or bake-poaching. 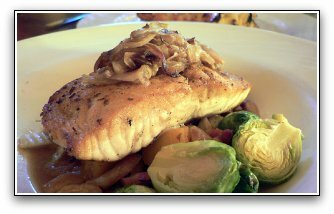 Braised Salmon over vegetables and topped with carmelized onions. Braising is a slow cooking technique generally used for concentrating flavor in less tender cuts of meat. Because fish is delicate and can't stand long cooking times, it takes on a different approach to cooking in this way. Although you can braise just about any fish you like, the more larger, firm fleshed fish can be more beneficial for this method. Tender fillets such as catfish and cod can fall apart on you. If you do braise a more tender cut, be sure to shorten the cooking time. Another option is to roll the fillet tightly before adding it to the pan to braise it. When braising fish, the fish is cooked in a small amount of liquid that should not completely cover the food. The liquid can be wine, milk, stock, broth, soup, or tomato sauce. The small amount of liquid that does remain once it has cooked can be used to make a sauce or simply spooned over the fish on the serving plate. To begin, place the fish in a pan with a very small amount of a dense concentrated liquid or sauce, no higher than a third of the thickness of the fish. Cover the pan and begin cooking it on the stove top or in the oven. Allow it to stew gently on a slow simmer until it is done. Generally, the fish should sit on top of the bed of vegetables and above the liquid. You can flavor the sauce with herbs, spices, onions, and vegetables. Moist and firm-fleshed fish such as salmon is easy to partner with more pronounced flavors, such as rosemary or curry powders. Milder tasting fish such as striped bass, are best suited with more subtle companions, like fennel, tomatoes, and lemon. Important Tip: Be careful not to overcook the fish. Once it has overcooked, it becomes firm, and there isn't any amount of liquid that you can add to it that will be able to fix it. If you'd like to, you can pan sear the fish before you begin to braise it, although it's not absolutely necessary, however, it is a personal preference to some people. To sear it first, add a teaspoon of unsalted butter or oil to a skillet over high heat, under a broiler, on a grill, or in the oven. Very quickly sear the fish on both sides until browned and then add it to the simmering braising liquid. The method of cooking fish in parchment paper packages, also known as en papillote, is a relatively excellent way of braising fish. Heavy duty aluminum foil packs are another good alternative. This technique traps the natural aromas of the fish and the seasonings inside the packets. When the fish has finished cooking, the packets are opened, and all the steam and aromatic smells come flowing out. Happy cooking fish and and good luck freshwater fishing! Enjoy!